China’s methanol capacity aggregates in Northwest regions, while capacity of downstream derivatives scatters over the country, leading to continuing regional flows. Since the latter half of 2016, producers have ramped up methanol production as margins improve. 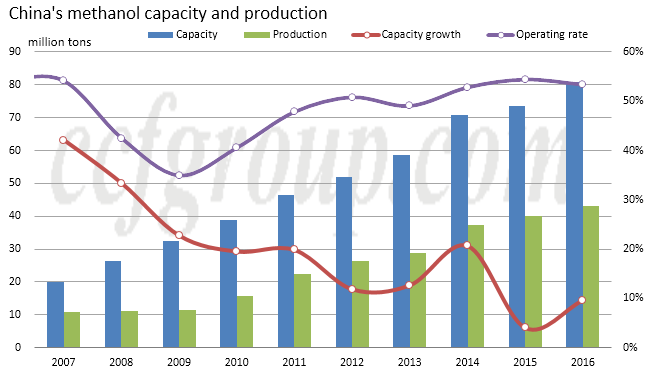 Domestic supply/demand structures is being altered due to the increase in operating capacity and the startup of new methanol-to-olefins (MTO) plants. The regional flows have been activated more than ever. China witnessed rapid growth in methanol capacity in 2011-2014, but the expansion slowed down in recent years. Methanol capacity added up to 80.78 million tons/year in the year of 2016 (including idled plants), up 9.7% from 2015. Due to the lack of natural gas, China’s methanol production is mostly based on using coal as feedstock. Domestic methanol capacity gathers in Northwest regions where there’s rich coal resources. However, the largest demand growth is seen in coastal regions, which leads to the sales of products and regional flows from place to place. Capacity in Northwest China totaled 41.35 million tons/year by the end of 2016, 35.32 million tons/year of which was effective. According to the data from National Bureau of Statistics, methanol output reached 19.86 million tons in Northwest China in 2016, reflecting quite low operating rate (one of the reason for low operating rate was that some new plants did not begin production until Q3 and Q4). In the first half of 2016, some methanol-to-olefins plants in Northwest, without combined methanol production unit or not having enough captive methanol capacity, purchased feedstock methanol locally to sate its appetite. In addition, there was consumption into formaldehyde, DME and acetic acid sectors. Therefore, the gap in supply and demand was rather small at that time. In September 2016, Shenhua Ningxia Coal started its 1 million tons/year methanol production unit, and the procurement of merchant feedstock methanol for MTO unit decreased sharply since then. In addition, Baofeng Energy stepped up methanol production, and the reliance of MTO unit on merchant methanol reduced; In Shaanxi, methanol output matched well with downstream production. Therefore, besides from Shenhua Yulin and ChinaCoal Mengda whose MTO plants were operating without captive methanol capacity, other MTO plants in Northwest China scaled back the procurement with some even selling methanol supply occasionally, which led to increase in methanol for sale from Northwest China. In the beginning of 2017, the arbitrage window to trade methanol materials from inland to East China opened, activating regional flows from Inner Mongolia to Jiangsu and Zhejiang Provinces via Tianjin Port and from Shaanxi to Jiangsu and Zhejiang via Hubei. Most supplies from Qinghai and Gansu were provided to Sichuan, Hunan and Hubei, and those from Shaanxi mostly went to Henan, Hunan, Hubei, Shandong and East China. Note: Dotted lines in the chart above show new methanol flows or flows where methanol volume increases in 2017. There are two routes to transport methanol out from Northwest China. The southern route is G20 Qingdao–Yinchuan Expressway, commonly referred to as the Qingyin Expressway (red line in the chart below). It’s an expressway that connects the cities of Qingdao, Shandong and Yinchuan, Ningxia. It is 1,600km in length. Methanol producers including Jinchengtai Chemical, ChinaCoal Yuanxing and Aowei Qianyuan in Inner Mongolia, and Yankuang Yulin, Yunlin Natural Gas Chemical and Shenmu Chemical in Shaanxi can transport tanks to the east by trucks. However, as there’re two large MTO plants (Shenhua Yulin and ChinaCoal Mengda) located in the vicinity of the region with an appetite for 3.6 million tons of feedstock methanol per year, cargoes sold to further east is limited. The northern route is G6 Beijing-Tibet Expressway (green line in the chart below), commonly abbreviated to Jingzang Expressway, 1,830km in length. Methanol transportation is busy on this route, as the expressway is accessible to Jiutai Energy, ENN Dalad Banner, Donghua Energy, Yigao Sanwei, Yiding Dongfang Energy and Rongxin Chemical, who have methanol products to sell. Conclusion: As methanol output rises with MTO plants ramping up upstream methanol production, new methanol plants coming online and some idled ones resuming operation in Northwest China, the length grows longer and materials to other regions are expected to increase. Methanol capacity totaled 5.75 million tons/year by the end of 2016. Medium-to-large companies like Lianmeng Chemical, Mingshui Dahua, Xinneng Phoenix and Yankuang Coal Chemical all have capacity above 500kt/yr in Shandong. Local demand from merchant methanol reached more than 6 million tons per year with MTO plants (Shenda Chemical’s 340kt/yr plant, Yangmei Hengtong’s 200kt/yr plant and Shandong Daze’s 300kt/yr plant) at capacity operation. The deficit in local methanol supply widened. There’s large MTBE capacity in Central and North Shandong, at about 6 million tons/year, requiring 1.5 million tons of feedstock methanol per year. In the consideration of consumption in other sectors like acetic acid, DME and formaldehyde, there was big gap in methanol supply which was filled by materials from Shaanxi, Shanxi and Inner Mongolia. South Shandong and its vicinity, North Jiangsu are the largest methanol production area in East China, where there’re 10 methanol producers. A part of the production was used internally to produce downstream derivatives, while the other part mostly went to Linyi City, South Shandong to sate the appetite in formaldehyde, DME, fuel products and other fine chemicals. This region maintained self-sufficient. However, the regional flows were changing with the evolvement of supply/demand structure. Lowed priced materials from Northwest China and some cargoes from Shanxi were diverted from North to South Shandong where demand was more stable and supply was shorter. In the end of 2016, Sailboat Petrochemical started its 830kt/yr MTO plant in Jiangsu, which required 2.5 million tons of feedstock methanol per year at capacity operation. The company plans to purchase some proportion of domestic methanol feedstock, so production from South Shandong seems to be the ideal source and sales volume from that area is expected to increase. In 2017, Mingshui Dahua, Xinneng Phoenix and Hualu Hengsheng plans to expand methanol capacity by 600, 200 and 1000 kt/yr respectively, which is likely to alter the supply/demand structure in Shandong. Conclusion: Shandong is converting from a methanol absorber to exporter, with the increase in methanol capacity. It needs to look for outlets, especially for production in South Shandong, as demand growth in traditional sectors are subdued. The price pegs to East China more than to Northwest China, because of Sailboat Petrochemical’s demand for feedstock. Methanol capacity added up to 15 million tons/yr together in Henan, Hebei and Shanxi, contributing 8 million tons of methanol production in 2016. Downstream formaldehyde and DME are two major applications that consume feedstock methanol in this region, however, plant operating rates are quite low in recent years with formaldehyde plants running at 40-50% and DME plants at 20% in average. Methanol production in these three provinces is mostly earmarked to sell to domestic markets elsewhere. In Henan, there’re two sources of methanol supply – one is production from local plants including Xinlianxin Fertilizer, Hebi Coal Chemical, Zhongyuan Dahua, Zhongxin Chemical, etc, the other is materials from Shanxi and Shaanxi. There’s 6.04 million tons/yr of methanol capacity in Henan, 4.83 million tons/yr of which is effective who produced 4.3 million tons of methanol in 2016. The production was first supplied to internal downstream plants then sold to local formaldehyde and DME plants. Some production could sold to Shandong and East China when arbitrage trading is workable. Some supplies may flow from Shanxi and Shaanxi to Henan when the price spread is large enough to cover the freight of 100-150yuan/mt from Shanxi and 150-200yuan/mt from Shaanxi to Henan. Capacity reached 5.32 million tons/yr in Shanxi, 66% of which was based on coke oven gas, supplemented by ammonia-methanol coproduction units and some coal-based methanol units. Production added up to 2.7 million tons in 2016, most of which flowed to other regions as local demand was limited. Shandong, Henan and some local consumption were the mainly destination for Shanxi methanol production. There’s 2.93 million tons of methanol capacity in Hebei. Capacity of each plant is mostly less than 300kt/yr and total production was less than 1 million tons in 2016. Methanol consumption goes into industries including formaldehyde, DME, MTG, where there’s demand for 2.5-3 million tons of methanol per year. The gap is mostly filled by supplies from Northwest China. Conclusion: Methanol production is not large in Henan, Hebei and Shanxi, but demand is limited as the same time. Methanol pricing in this region pegs more to price in Northwest China. Capacity totaled 4.02 million tons/yr in Southwest China (Sichuan and Chongqing), 87% of which was based on natural gas as feedstock. Margins have improved in 2017, incentivizing products to restart their plants including Jiangyou Wanli’s 150kt/yr plant, Da Steel’s 200kt/yr plant and Luzhou Natural Gas Chemical’s 400kt/yr plant. Therefore, methanol production increases considerably this year. However, demand in Southwest China is mainly seen in traditional sectors, like formaldehyde with its capacity at 1 million tons/yr, DME with 0.5 million tons/yr and acetic acid with 0.45 million tons/yr of capacity. Demand for methanol can be calculated at 0.8 million tons per year, less than half of the production, as downstream sectors do not glitter. Therefore, largest part of production flows to East China. Methanol flows out from Southwest China depends on trucks and ships. Some supplies are transported by trucks to neighboring areas and further to Yunnan, Guizhou and Guangxi. Other companies (Chongqing Carbinol, Sichuan Vinylon) depend on Yangtze River to ship out cargoes, where the freight is at around 130-190yuan/mt. It takes 10-15 days for ship to arrive at East China. However, the trading volume has decreased since March, as price dropped in East China and Chongqing Carbinol took its plant offline for maintenance. Conclusion: Methanol market in Sichuan and Chongqing is oversupplied. Producers prefer to sell products to East China and Guizhou where methanol prices are higher. The pricing pegs both on Northwest and East China methanol prices. The direct driving force to regional flows is the change in supply/demand structure. As there’re upcoming methanol plants in Shandong and MTO capacity to be back on stream in East China, methanol flows may see new features and it is likely to be more active in methanol flows from West to East and from North to South.